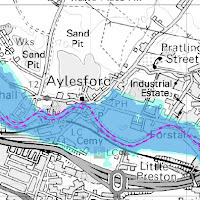 As you will see, flooding can occur beyond the flood defence (the pink line) so it is important to protect your personal belongings. Your insurance company can replace furniture, flooring, electrical goods etc but what they can't replace are your photos or other sentimental items. Put them in a plastic bag and take them upstairs for safe keeping. Make sure you have your insurance details in a plastic bag somewhere out of the way, but even if you don't your insurer will have your details on file. At the time of writing there are no flood warnings in place for Kent, but it is always better to be safe than sorry, especially as this week's floods have shown that flash flooding can wreak havoc and our flood defences have been unable to cope.